First it was iBooks, then came Newsstand, and now Apple has even thrown iTunes U – its attempt at cornering the textbook market – into the mix. With all of these book-centric apps knocking about, keeping tabs on all your readable content can be a little difficult, particularly if you’re an avid bookworm or someone who enjoys keeping up-to-date with current affairs. In a change to its previous strategy, Apple has opted to keep everything separate nowadays. Before, for example, music and video were kept behind one little orange icon marked "iPod" on the iDevice SpringBoard. As of iOS 5, though, there’s one for music, and another one for video. 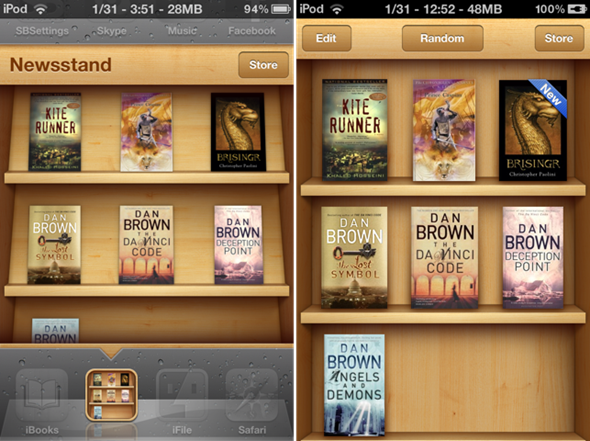 Such has been the case with iBooks and Newsstand, which too are separate entities as opposed to one, amalgamated app. 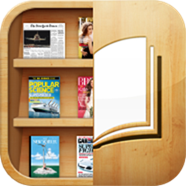 Booksstand, a jailbreak tweak available over at the BigBoss repo, allows you to place all (or some, if you prefer) of your iBooks content into the Newsstand app, enabling you to keep a watchful eye over all of your content. It doesn’t move the books per se, but simply creates a bookmark in Newsstand from which it will quickly hop to your selected title. For those seeking minimalism, this would seem the perfect tweak. While of course, iBooks will still need to be installed in order to grab content from the iBookstore, it can be tucked away out of sight – to be revisited only for the purpose of creating bookmarks for new purchases. It costs 99 cents, which is none too steep – especially if you find flitting between two different apps to be a trying task. Booksstand is certainly a tweak of convenience over organization though, so please bear this in mind before parting with your cash.